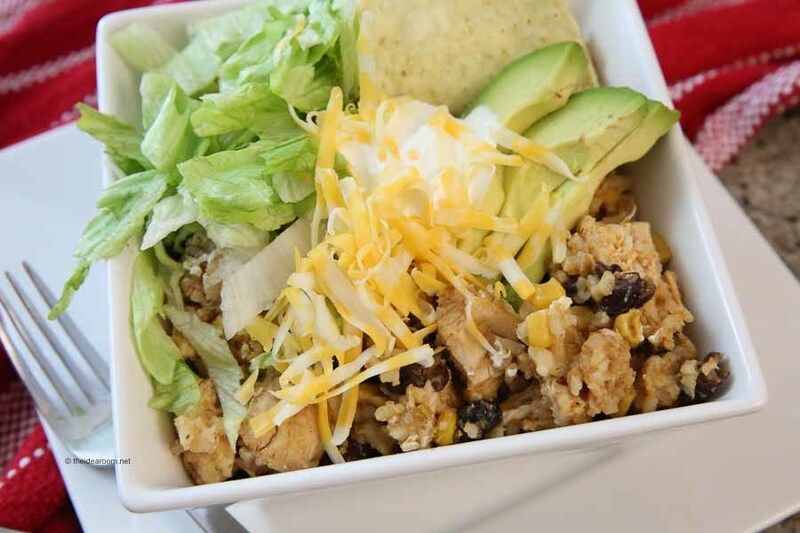 We love a great Chicken Burrito Bowl! 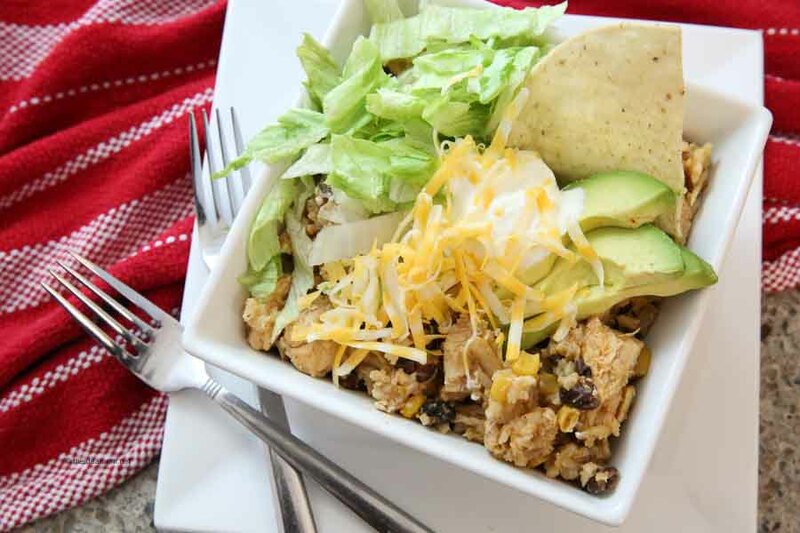 Use your Instant Pot for this Instant Pot Chicken and Rice to make some delicious Burrito Bowls! 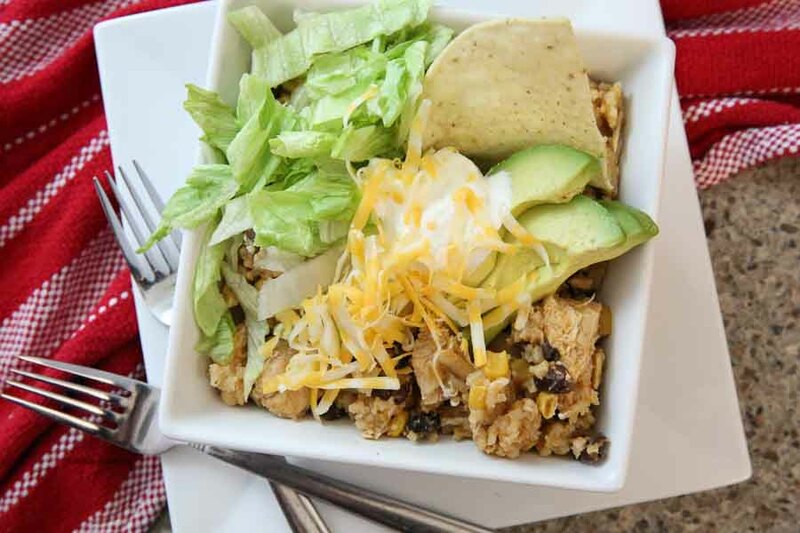 A fast and simple Chicken Burrito Bowl Recipe the whole family will love! Today I am sharing another one of our family’s favorite go to Instant Pot Recipe. 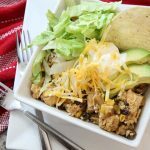 This Instant Pot Chicken and Rice Burrito Bowls Recipe is so easy to make and can be on the table in 30 minutes! I LOVE a main dish recipe that is quick and easy don’t you? 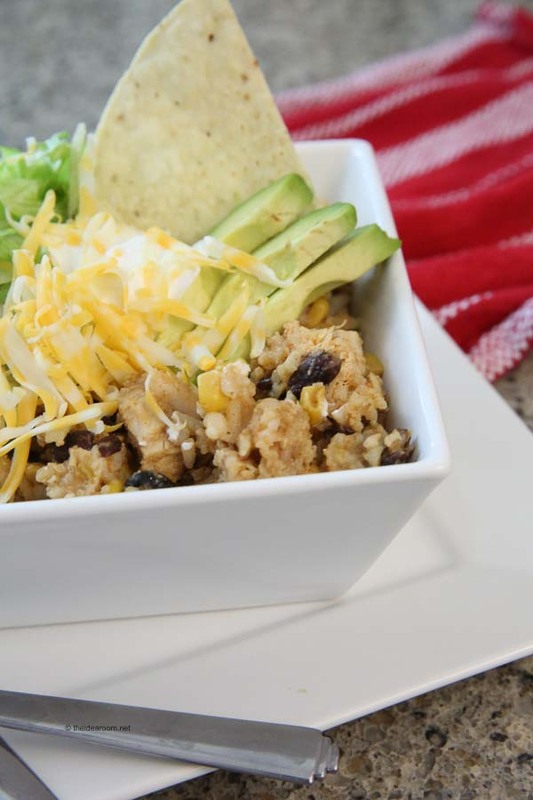 This dish is also a great for making a gluten free Chicken Burrito Bowl. Just make sure you are using gluten free chicken broth and spices. The whole family will enjoy this chicken and rice instant pot recipe! I like to use frozen chicken breasts, mainly because I don’t usually remember to get them out early enough for them to thaw! So the Instant Pot makes it super convenient for people like me to get dinner on the table fast! I really love Chicken Burrito Bowls because of how versatile they are. The family can pick and choose what they want to mix into the bowls to make them just the way they want them. We love to add sour cream, shredded cheese, extra salsa, green taco sauce, avocados, tomatoes and tortilla chips! Get creative and add in your favorites! Add the oil to the Instant Pot, turn on sauté setting, and heat until the oil is shimmering. Add the onion and garlic and cook, stirring occasionally, until softened, about 4 minutes. Stir in the chili powder and cumin. Cook for about 30 seconds. Add 1/4 cup of the chicken broth and cook, gently scraping the bottom of the pot with a wooden spoon to loosen any stuck-on bits, and simmer for 1 minute. Add the chicken, salt and pepper, beans, corn, salsa, and stir to combine. Sprinkle the rice on top of the chicken and beans mixture and pour the remaining 1/2 cup broth on top of the rice, but do not stir. Using your pressure cookers manual setting, set the pressure to HIGH for 15 minutes. Close and lock the lid. After cooking time is up let the cooker natural release for 10 minutes. Let release the rest of the pressure manually. Cut chicken into cubes. Gently stir everything together. Divide between bowls and top with the cheese and other toppings. *Be sure to add the rice last so that it will not burn on the bottom of the Instant Pot pan! If using chicken that is not frozen, you can cut the cooking time down by 5 minutes. Are you new to the Instant Pot and not sure how to get started? 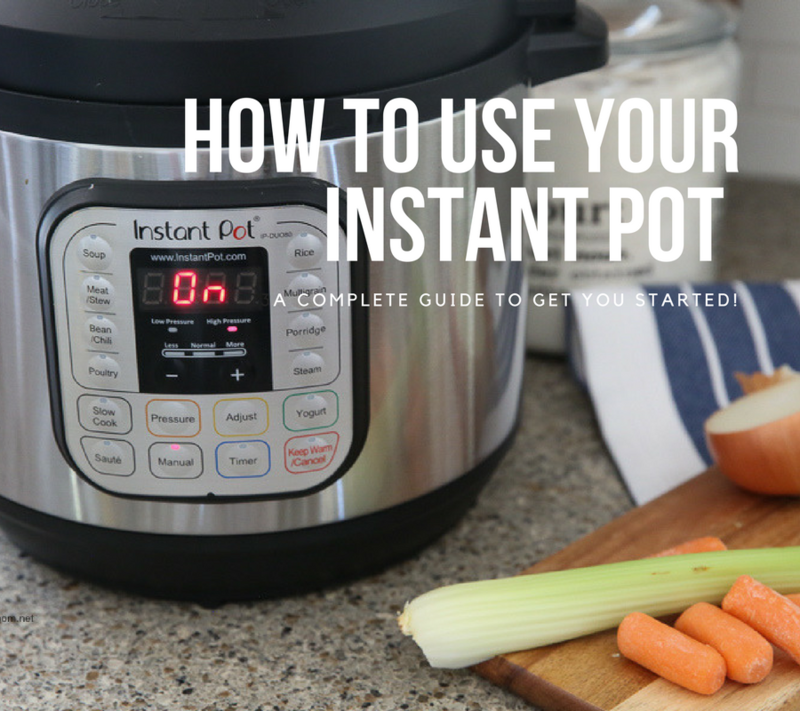 Check out our guide: How to Get Started Using Your Instant Pot! You may also be interested in this collection of Instant Pot Recipes. This looks awesome! Just a question…if I was to use a sprouted brown rice would that work the same or would I need to adjust something? Fairly new to my Instant Pot but loving it so far! Thanks for all the awesome recipes! SO, I was using frozen chicken breasts like you mention in the blog, but then the recipe calls for cut up pieces of thighs. Do you throw the chicken breasts in whole? Do you try to cut them frozen? I’m confused. Julie- You can cut the chicken after it is cooked into cubes. Hopefully, that answers your question. Thanks and enjoy the recipe! You should update the cooking time. You omitted the 10-15 minutes to get up to pressure in the instant pot. Still a very easy recipe – dumps in the ingredients and let the instant pot do the work!! Michael-I will have to add that to the recipe. Thank you!